Following on from my post last week, could I be addicted to just one cup of coffee a day, I decided to go cold turkey on the coffee front. It has now been one week, one day and five hours since I last had a cup of coffee. This past week has been trying, to say the least. 11:30 My patient hasn't arrived at her appointment, and now I'm feeling a little tired with a break in my busy day, especially after the four day weekend. I consider a coffee, remember I don't NEED it. A few minutes later, I consider maybe just a little, half a cup, and then a quite reluctantly resign myself to pouring some hot water over a sad looking lemon and ginger tea teabag. 16:45 I am exhausted on the way home and my head feels cloudy. 10:00 I am desperate for a cup of coffee. Forget NOT NEEDING it, I NEED it...Settle for a terrible tasting green tea. 13:00 My eyes are feeling sensitive to sunlight and I am trying to keep my back to the dull rays of British sunshine coming through the window anytime I have to talk to anyone. 15:00 This is a full blown headache, manage to take two ibuprofen between patients. 17:00 Headache is still in fully fledged power. Meet a friend for a catch up at Starbucks, head is so sore that the temptation of coffee is almost unappealing, almost. Have a soy chai latte and a large glass of water. 7:45 Headache is still a dull throb. I almost buy a decaf coffee as I buy my lunch in the morning. Had to buy lunch as couldn't face making it this morning with the headache. Stop myself just in time from buying the decaf, I had promised to stop drinking all coffee. 13:00 You don't NEED a coffee I tell myself. There is NO WAY you will fall asleep whilst with a patient if you don't have one. I grumpily pour myself a peppermint tea. I can't wait for the end of the day. 17:00 Fall asleep on the train on the way home, I feel awful. 7:45 My head feels a little clearer this morning. The magnetic pull towards the prospect of coffee appears to have subsided a little? 17:00 The day has flown by. I am very pleased I resisted the decaf. 11:00 Out for Breakfast at my favourite local breakfast place, The Pantry. I order a black rooibos tea and look only fleetingly, with mild adoration at the lattes, cappuccino's and americano's that surround me. 17:00 My friend Mike introduces me to green tea with blueberry flavour after I whinge about how much I despise the taste of green tea. It is surprisingly delicious. 12:00 I order a lovely cup of fresh jasmine tea with my lunch at Petersham Nursery in Richmond after a walk in the park. 17:00 I realise that I have not craved a cup of coffee all day! I order some of the Green Tea with blueberries, as Mike says it's not that easy to find in all supermarkets. I order a few other flavours too! And I have so much energy left over still at the end of the day! My relationship with coffee is currently off. Until further notice I will be embracing all teas herbal. Wow I have admiration for people who kick major addictions. 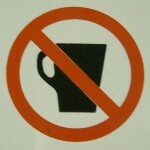 This relinquishing of one cup of coffee a day really upset my mood, head clarity and energy levels.